On June 23rd I suspect that those who put the cross in the ‘Leave’ box will substantially do so because of concerns over immigration; and those who choose the ‘Remain’ box will be swayed by the certainty of the status quo, and not by the positive reasons to stay. In my opinion these are both the wrong reasons to vote one way or the other. To me the vote is a far bigger and longer-term issue of whether or not British people wish to be forever tied to and increasingly directed by the wider EU. In other words, is it a club that works and do we want to be an active member of it? First we need to ascertain the goal. Its original primary purpose, as set out initially in the Treaty of Rome in 1957, was for European nations to work together so as to avoid future conflict within the region. The goal also included economic co-operation, ultimately leading in 1999 to the core of the club creating a single European currency and monetary policy. From an economic perspective this does not make sense. To tie monetary policy together but leave fiscal policy largely up to the individual nations leaves the playing field highly uneven. On the one hand, we want to work together, but on the other hand each nation is keen to protect certain groups within its society. The European Central Bank might set one common bank rate, but as I write, the Greek government must pay over 8% p.a. more than their German counterparts to borrow money for 10 years – so the playing field is anything but even. This can be resolved by the German government (and therefore ultimately its tax payers) permanently writing cheques to others in order to smooth the imbalances. Ultimately, however, the real problems – such as high youth unemployment in the periphery – remain unresolved. I wonder how long it will be before the citizens in the core decide that these perpetual transfers of wealth are unfair. In the end, single monetary policy can only work hand in hand with single fiscal policy, and if national governments no longer control taxation then they become downgraded to the status of local councils, ultimately ceding sovereignty to a central European body. A “United States of Europe” must be the ultimate goal with “ever-closer union” having always been at the core of the Treaties. This in turn asks serious questions about the democratic process, and substantially dilutes the democracy that we enjoy in the UK. With so much propaganda and guesswork from both camps, let us take a look at a couple of economic facts comparing and contrasting the UK with the Eurozone since its inception in 1999. 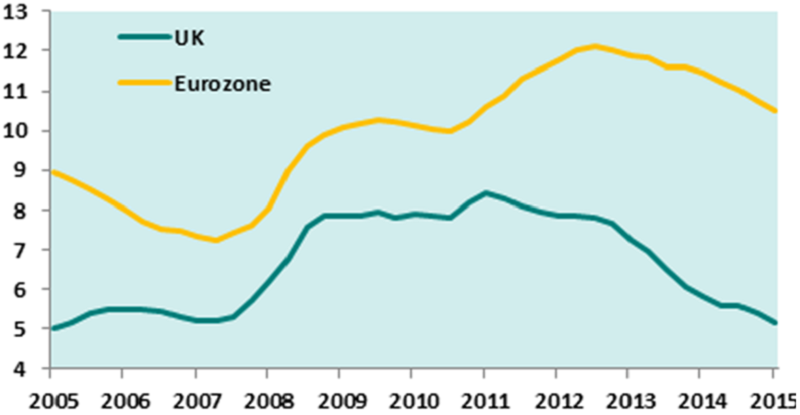 In the 68 quarters since the Eurozone’s inception, the annualised GDP growth in the UK economy has exceeded that in the Eurozone on 45 occasions – or two-thirds of the time. On average the UK economy has grown at a 2.0% annualised rate over this period whereas the Eurozone has grown 0.7% slower each year at only 1.3%. Meanwhile, the Eurozone unemployment rate has remained in double figures for five consecutive years, whereas that in the UK is 5.1% at the time of writing – see chart. What worries me and strikes at the heart of the economic question of being a Eurozone member is that, post the Global Financial Crisis when unemployment rose sharply, the recovery came through in the UK, but the rate continued to rise in the Eurozone, not peaking until 2012. Even now, 8 years on from the crisis, Eurozone unemployment remains substantially above pre-crisis levels. Many assertions have been made by those on both sides of the argument about the costs and benefits of leaving. The simple answer is that those commentators are guessing, as there is no precedent upon which we can make any scientific estimate. What we do know is that the UK pays a net contribution of £7bn each year to the EU – or £262 per household. This would be saved, although I concede that extra costs (such as in drafting new legislation) would be offset against that. And those scaremongers who say that London will decline as Europe’s financial centre again have nothing on which to base this. The same argument was prevalent when the Euro came into existence in 1999 and London has extended its dominance since then. To me, sitting on the EU fence whilst remaining out of the Eurozone is fudging the issue. Ultimately we will need to decide whether we are wholeheartedly behind a fully integrated Europe or alternatively willing to go it alone. The longer we sit on the fence the more acrimonious the divorce will be when it comes. We should decisively leave now and strive to flourish as an innovative nation, without the constraints of EU bureaucracy. The central weakness of the Leave campaign is that its proponents cannot define what the world according to Out actually looks like. Put simply, Brexit represents a step into the dark, with no certainty over the trading arrangements that the UK would be able to negotiate. Some Eurosceptics argue that Britain should follow in the footsteps of Norway, which quit the EU but retains access to the single market. This access would be vital since almost half Britain’s exports go to the EU. However, Norway’s situation is far from ideal as it must observe all the EU’s single-market regulations without having a say in them, make payments into the EU budget (around 90% of Britain’s net contribution per head) and accept free movement of EU migrants. As a Norwegian minister put it, “if you want to run Europe, you must be in Europe. If you want to be run by Europe, feel free to join Norway.” Others contend that Britain should strike trade deals on a country-by-country basis. But this would see British companies paying higher tariffs to trade internationally. Whatever trading arrangements Britain ultimately adopts, the terms are unlikely to be as favourable as those it currently enjoys. That is because a vote for Brexit would trigger an application to withdraw under article 50 of the Lisbon treaty. This stipulates that the EU will negotiate a new agreement with the withdrawing country and, crucially, will act without the involvement of the country that is leaving. To get a sense of the negotiating dynamic in the bitter post-Brexit atmosphere, picture a divorce demanded solely by one partner, the terms of which are set unilaterally by the other. It is also important to consider that, at a time when populist anti-EU parties are gaining momentum across the region, EU members would be heavily incentivised to impose a harsh settlement to discourage other countries from leaving. Such intractable negotiations will create a prolonged period of uncertainty over Britain’s new relationship with the EU. This will discourage investment, especially foreign direct investment, of which Britain is the biggest net recipient in the EU. That is particularly alarming for a country with a large current-account deficit, which must be financed by capital inflows. Consequently, markets would demand a considerably higher risk premium to invest in UK assets, triggering a sharp fall in sterling and the price of UK equities, real estate and gilts. Weaker sterling could stoke inflation, squeezing real household incomes and depressing consumer spending. Thus, a vote to leave the EU would deliver an immediate and simultaneous economic and financial shock to the UK. The longer-term economic impact is likely to be even more damaging. Take financial services, a vital industry that represents up to a tenth of UK GDP. The City of London’s success is due in no small part to its use as a springboard for selling products into Europe, as well as its ability to provide firms with a huge pool of talented workers to hire from across the continent. Indeed, 40% of the UK’s financial services are currently exported to the EU, while 11% of the City’s 360,000 workers come from elsewhere in the Union. Thus, two of London’s most important attractions would be called into question by a Brexit, undermining its status as a leading global financial centre. But the longer-term costs would go far beyond economics. A Brexit would almost certainly lead to a splintering of the Conservative Party, with Cameron stepping down as Prime Minister after his position becomes untenable. Scottish nationalists would likely capitalise on the opportunity to call another referendum on independence. Meanwhile, a Brexit could destabilise Northern Ireland, where the peace process has depended on the fact that both Ireland and Britain are members of the EU. Little wonder the Irish government is among the most vocal supporters of the campaign for Britain to stay in. It is not just the UK that risks a post-Brexit break up. Given that the EU is facing an existential crisis, with a growing number of populist parties agitating for divorce, Brexit could open a Pandora’s box and ultimately bring about the collapse of the European project. Even assuming that the EU emerges from a Brexit intact, it would undoubtedly be weaker. After all, it would have lost its second-largest economy, one of its biggest military powers and its most significant foreign-policy actor. Poorer, less secure and disunited, the UK and the EU would face a world where threats from terrorists and foreign powers are at their most severe in years. The bottom line is that a vote for Brexit entails significant economic and political risks with little obvious reward.